Magnum Photo Contact Sheet exhibition. : Tim Soter… blog. Magnum Photo Contact Sheet exhibition. Last night’s opening for the Magnum photo collective brought out most of its prestigious and infamous members, most in town specifically for the annual voting in (or not) of new members. One can only imagine the Skull & Crossbones-like operations behind the scenes; an applicant has a slim margin for becoming and appli-CAN and the voting process has yielded more than a few epic arguments. If there is a secret handshake I’d like to learn it, maybe a pass phrase “F eight… and beware!” Do read member Alec Soth’s republished account of Magnum member Philip Jones Griffiths’ strongly worded opposition to the inclusion of Martin Parr. Just as salacious is the account of the agency’s 60th Anniversary party. On hand last night were Parr himself, Alec Soth, Bruce Davidson (who’s documentation of the Brooklyn gang, the Jokers was one of my favorite early influences,) Josef Koudelka, Larry Towell, Thomas Hoepker and funny man Elliot Erwitt, among others. The theme was contact sheets, some enlarged from 35mm and most with the iconic print that came from that roll or negatives or chromes. A bit of observation and context revealed a few nice surprises. 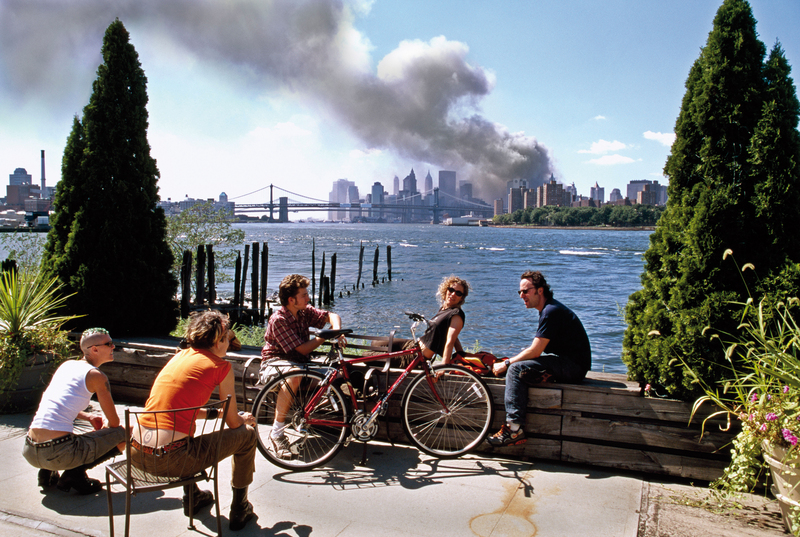 I didn’t realize that Thomas Hoepker, most famous for his portraits of Muhammad Ali, shot the controversial photo of youth in Williamsburg, Brooklyn, seemingly very casual as the World Trade Center burns in the background. Also surprising, though it shouldn’t be, is that the photo was shot on slide film. I remember that day of course but it still seems so recent – the digital age is moving so swiftly that film seems way more archaic that fourteen years ago. Or fourteen years ago seems much more recent. Photographer Andrew Hetherington and I discussed a Martin Parr contact sheet (BELOW,) two columns of four photos, one of them being an iconic image from ‘Last Resort’ one of Parr’s best known works. None of the others from the roll work at all. They’re clear misses. But the shot that Parr made of the ice cream server, who’s in that stage between being a girl and a woman is being leered at by a younger boy is spot on – perfect, right down the the balanced fill flash. He had once chance and it was a success. In today’s era a digital contact sheet would have revealed ten photos nearly identical on either side of that exposure. But even more importantly it would reveal a subject who is way more incredibly self-aware, certainly when it comes to photography and its end results. The biggest surprise for me was the Elliot Erwitt contact sheet (TOP) with the famous image of a tiny dog next to a woman’s legs (BELOW.) The image size suggests that it was made with a 35mm camera, but the contact sheet revealed it was taken by a medium format 2 1/4″ x 2 1/4″ negative camera, almost surely a twin-lens reflex camera. Surprising because it shows the vantage point of the photographer – had the shot been made with a 35mm camera Erwitt would have been literally lying on the ground. With the twin-lens reflex and it’s top mirror viewfinder he could have held the camera just between his knees or most likely set it on the ground. It also shows his skill at post-visualization, using the crop to create an image, not only exclude some extraneous information in the frame. if you can’t make it to the show at Milk Studios in New York, you can of course buy the book or purchase a beautiful contact sheet print, printed as an open edition, for only $350 off the Magnum website. Quite reasonable, give it a look!